The oxygen reduction kinetics on an La2NiO4 + δ electrode for electrodes of different thicknesses was investigated by means of electrochemical impedance spectroscopy. Dependences of the polarisation resistance in the temperature range from 700 to 800 °C, and oxygen pressure range of 0.2–16 kPa were obtained. It was established that three relaxation processes determined the overall polarisation resistance. Probable electrode reaction stages were suggested: oxygen ion diffusion on the electrode/electrolyte interface, charge transfer in the adsorption layer, oxygen surface exchange, and diffusion in La2NiO4 + δ. 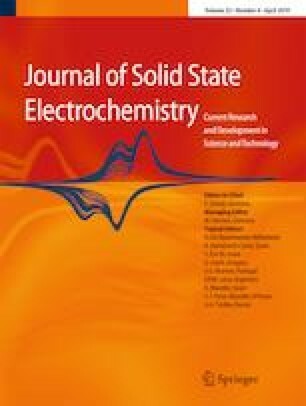 The influence of the electrode thickness on the electrochemical performance of La2NiO4 + δ electrodes was shown. The correlations between the electrochemical data and isotope exchange data are discussed. The study was financially supported by the Russian Science Foundation, project no. 17-73-10196. The facilities of shared access centre “Composition of Compounds” of IHTE UB RAS were used. The education activity of Ph.D. and master students involved into this work is supported by Act 211 of the Government of the Russian Federation, agreement no. 02 A03.21.0006.